“……never been tested in humans with smallpox because the disease was declared eradicated in 1980, three years after the last known case. An FDA panel, comprised of independent medical experts, voted 17 to 0, that the benefits of TPOXX outweigh its risks as Smallpox antiviral therapy. SIGA Technologies, Inc. announces the submission of its New Drug Application (NDA) to the U.S. Food and Drug Administration (FDA) for the oral formulation of TPOXX® (tecovirimat) to treat smallpox. NIH-appointed the seven-person blue ribbon panel to investigate the July 2014 discovery of 6 smallpox samples in an abandoned group of 300 lab samples that were in an unsecured Food and Drug Administration (FDA) cold-storage room during preparations for a move to the FDA’s main campus. In August of 2016, the National Institutes of Health (NIH) appointed a Blue Ribbon Panel to review the July 2014 discovery of six vials containing variola virus, the causative agent of smallpox, as well as over 300 other previously undiscovered biological samples on the NIH Bethesda, Maryland campus. The samples were found in an unsecured cold-storage room in a building occupied and managed by Food and Drug Administration (FDA) staff under NIH biosafety and biosecurity oversight. The Panel includes a diverse group of seven external subject matter experts, and was constituted as a Working Group of the National Science Advisory Board for Biosecurity (NSABB), a federal advisory committee to the United States Government. The Panel began its work in August of 2016 and completed this final report in May of 2017. The Blue Ribbon Panel was charged with a number of tasks, including, 1) to determine how the smallpox virus vials came to be improperly stored and overlooked for years; 2) to identify any systemic issues that contributed to the lapse; and 3) to evaluate whether NIH had taken adequate corrective actions in response to this incident. It should be noted that this incident was one of several biosafety lapses involving federally regulated pathogens that occurred in the United States in 2014. These incidents caused considerable concern and led to substantial remedial activity throughout the United States Government. 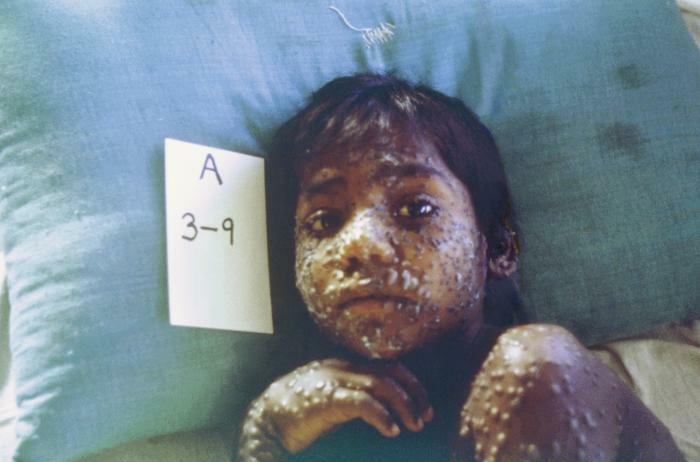 Smallpox was a devastating, contagious disease that infected over 300 million people in the 20th century, killing up to 30% of those infected. It was declared eradicated by the World Health Organization in 1980, and by international agreement, the remaining acknowledged samples were to be placed under tight control and oversight in only two repositories: in the US, at the Centers for Disease Control and Prevention (CDC) in Atlanta, Georgia and in Russia, now at The State Research Center of Virology and Biotechnology (VECTOR), Novosibirsk. While there are now smallpox vaccines available in the U.S. should they be needed, routine vaccination of Americans ceased in the mid-1970’s. As a result, nearly half of the population is unvaccinated, and, because vaccine effectiveness wanes over time, nearly the entire US population is potentially vulnerable to infection. The finding of viable smallpox virus samples outside of the established repositories was totally unanticipated and required an appropriate response and a rethinking of laboratory biosafety and biosecurity policy at NIH. campus, and interviewed those who had knowledge of or responsibility for the response. The Panel assessed that the incident has been now adequately evaluated and documented. Some questions remain, however, including the identity of the original owner of the samples and how they may have come to be in the cold-storage room. Unless further new information surfaces to solve this mystery, it is unlikely to be resolved, due to the passage of time. In addition, storage of the samples likely occurred before the Select Agents Program was established, at a time when biosafety standards were very different from today. The Blue Ribbon Panel identified several key factors that contributed to the smallpox virus incident: There was a lack of individual responsibility for infectious materials in the FDA occupied space where the vials were found. 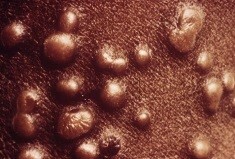 There were also numerous missed opportunities to find the samples prior to 2014, particularly in the 1980’s when all smallpox virus samples were required to be either destroyed or sent to CDC, and again in 2003 when laws governing the possession of regulated pathogens, called “select agents,” were implemented. In addition, a lack of policies for dealing with abandoned research materials and for regular inventory of potentially hazardous biological materials were major contributors to the occurrence of this incident. The panel assessed the response to the incident as appropriate and thorough, with excellent inter-agency cooperation (including the FBI) to manage a highly unusual situation. However, the Panel noted several specific problematic issues relating to the immediate response after discovery of the smallpox virus and other samples. In particular, the Panel determined that given the potentially hazardous nature of the abandoned samples, there are significant concerns about how they were packaged and transferred between buildings on the NIH campus. Following the discovery by an FDA official, it was decided by NIH that the samples should be immediately transferred to a secure high-containment Biosafety Level 3 laboratory. The samples, in their original boxes, were packaged into a larger cardboard box, and then handcarried to the secure NIH laboratory. No negative consequences occurred — there were no infections or injuries — but packaging and transport of the samples were conducted in ways that presented both biosafety and security risks. Other concerns identified by the panel included inadequate chain-of-custody and logging of events directly after the discovery of the vials, and the use of cardboard in cold-storage rooms. Although secondary to the issues associated with this event, cardboard containers can contribute to mold and unsanitary conditions. The Panel assessed efforts pursued by NIH following the incident that were intended to improve biosafety and biosecurity procedures and minimize the likelihood of such occurrences in the future. It was determined that most of the factors and causative issues have been addressed by NIH’s subsequent efforts and policy revisions and are detailed in the report. However, there are several remaining issues requiring attention. The Blue Ribbon Panel offers to NIH the following observations and recommendations. First, with regard to specific, detailed steps NIH should take to remedy remaining gaps in biosafety policies and procedures, the BRP recommends:  Revise several specific biosafety policies and procedures, as detailed in the report.  Rapidly finish the on-going space audit to ensure responsibility and oversight of all research materials is assigned to individuals by name, and updated as required by personnel changes.  Ensure that any shared research space arrangements have clear written agreements with responsibilities well defined.  The BRP noted that NIH policies and procedures use terms that are not in general use; such as “High consequence pathogens,” “and “potentially infectious materials. These categories need to be defined carefully or eliminated when not clearly necessary.  Effective and complete implementation of current policies, procedures, guidance and practices on an on-going basis over time will be critical to ensuring safety and security surrounding pathogen research at NIH.  The importance of leadership at the highest levels and continuous efforts to develop and maintain a culture of safety and responsibility among research staff cannot be overemphasized.  There would be significant benefits to having consistent biosafety and biosecurity policies across the Department of Health Human Services (HHS) and the entire USG; ideally, insofar as possible, these should be harmonized with efforts by governments and international institutions as well. The BRP recommends continuing on-going efforts to address these issues.  Response plans coordinated and exercised with agencies outside of HHS, including the Federal Bureau of Investigation, the Environmental Protection Agency and others, as needed, remain important.  The variola virus incident illustrates how changes in infectious disease epidemiology and biosafety practices over time can radically alter a situation from “standard lab practice” to a potential major public health event. previously considered a significant biosecurity concern, need to be routinely re-evaluated to ensure proper biosafety and handling so that public health and safety are not compromised. Preexposure vaccination is recommended for laboratorians at risk for repeated exposure to fully virulent B. anthracis spores, such as those who 1) work with high concentrations of spores with potential for aerosol production; 2) handle environmental samples that might contain powders and are associated with anthrax investigations; 3) routinely work with pure cultures of B. anthracis; 4) frequently work in spore-contaminated areas after a bioterrorism attack; or 5) work in other settings where repeated exposures to B. anthracis aerosols may occur. Read more[PDF – 36 pages](https://www.cdc.gov/mmwr/pdf/rr/rr5906.pdf). Artesunate is in the class of medications known as artemesinins, which are derivatives from the “qinghaosu” or sweet wormwood plant (Artemisia annua). Artesunate is not currently licensed by FDA but is made available in the United States under a CDC-sponsored IND protocol for treatment of documented cases of severe malaria(https://www.cdc.gov/malaria/about/index.html) that require parenteral therapy. Read more(https://www.cdc.gov/malaria/diagnosis_treatment/artesunate.html). Benznidazole is a 2-nitroimidazole trypanocidal agent that was introduced in 1971 for the treatment of Trypanosoma cruzi infection—i.e., Chagas disease, also known as American trypanosomiasis(https://www.cdc.gov/parasites/chagas/). Benznidazole is one of two drugs available from CDC for the treatment of Chagas disease (the other is nifurtimox). In the United States, the need to have drugs available for treating Chagas disease has been increasing, largely because of implementation of T. cruzi blood-donor screening in 2007, which has identified chronically infected persons (mainly Latin American immigrants) who might benefit from treatment and has heightened awareness of Chagas disease. BabyBIG® (botulism immune globulin) remains available for infant botulism through the California Infant Botulism Treatment and Prevention Program. Clinicians who suspect a diagnosis of botulism in a patient should immediately call their state health department’s 24-hour telephone number(https://www.cdc.gov/mmwr/international/relres.html) to maintain effective botulism surveillance and to facilitate rapid detection of outbreaks. The state health department will contact CDC to arrange for a clinical consultation by telephone and, if indicated, release of botulism antitoxin. State health departments requesting botulism antitoxin should contact the CDC Emergency Operations Center (EOC) at 770-488-7100. Read more(https://www.cdc.gov/mmwr/preview/mmwrhtml/mm5232a8.htm). DEC is an antihelminthic agent used for treatment of lymphatic filariasis (caused by infection with Wuchereria bancrofti, Brugia malayi, or Brugia timori), tropical pulmonary eosinophilia, and loiasis(https://www.cdc.gov/parasites/loiasis/); DEC also has prophylactic benefit for Loa loa infection. DEC has been used worldwide for more than 50 years. In the past, Wyeth-Ayerst Laboratories made DEC available as a licensed drug; in the late 1990s, because of unavailability of a bulk chemical supplier, Wyeth-Ayerst discontinued distribution of DEC in the United States. Diphtheria antitoxin (DAT) is used to prevent or treat diphtheria by neutralizing the toxins produced by Corynebacterium diphtheriae. DAT is a sterile, aqueous solution of the refined and concentrated proteins, chiefly globulins, containing antibodies obtained from the serum of horses that have been immunized against diphtheria toxin. DAT is available under an IND protocol sponsored by CDC and is released only for actual or suspected cases of diphtheria(https://www.cdc.gov/diphtheria/about/index.html). The antitoxin is stored at CDC Quarantine Stations located in major airports around the nation, ensuring delivery to any location in the United States within hours. Eflornithine is an antitrypanosomal agent that inhibits the enzyme ornithine decarboxylase. Antitrypanosomal treatment is indicated for all persons diagnosed with African trypanosomiasis (sleeping sickness)(https://www.cdc.gov/parasites/sleepingsickness/); the choice of therapy depends on the infecting subspecies of the parasite and on the stage of the infection. Eflornithine is considered the drug of choice for the treatment of second-stage Trypanosoma brucei gambiense (West African) infection, with involvement of the central nervous system. It is not effective against T. b. rhodesiense (East African) infection (see melarsoprol). Although the manufacturer, Aventis, maintains its US licensure, eflornithine is not commercially available in the United States. Melarsoprol is an organoarsenic compound with trypanocidal effects that has been used outside the United States since 1949. Antitrypanosomal treatment is indicated for all persons diagnosed with African trypanosomiasis (sleeping sickness)(https://www.cdc.gov/parasites/sleepingsickness/); the choice of therapy depends on the infecting subspecies of the parasite and on the stage of the infection. Melarsoprol is used for the treatment of second-stage infection (involving the central nervous system). It is the only available therapy for second-stage Trypanosoma brucei rhodesiense (East African) infection, whereas eflornithine typically is used for second-stage T. b. gambiense (West African) infection. Nifurtimox is a nitrofuran analog that was introduced in 1965 for the treatment of Trypanosoma cruzi infection—i.e., Chagas disease, also known as American trypanosomiasis(https://www.cdc.gov/parasites/chagas/). Nifurtimox is one of two drugs available from CDC for the treatment of Chagas disease (the other is benznidazole). In the United States, the need to have drugs available for treating Chagas disease has been increasing, largely because of implementation of T. cruzi blood-donor screening in 2007, which has identified chronically infected persons (mainly Latin American immigrants) who might benefit from treatment and has heightened awareness of Chagas disease. Sodium stibogluconate (Pentostam®) is a pentavalent antimony compound used for treatment of leishmaniasis(https://www.cdc.gov/parasites/leishmaniasis). The three main clinical syndromes in humans are visceral, cutaneous, and mucosal leishmaniasis. Pentostam is a well-established antileishmanial agent that has been used in many countries of the world for more than half a century. Suramin is a negatively charged, high-molecular-weight sulfated naphthylamine. It was introduced in the 1920s for the treatment of African trypanosomiasis (sleeping sickness)(https://www.cdc.gov/parasites/sleepingsickness/). Suramin generally is considered the drug of choice for first-stage Trypanosoma brucei rhodesiense (East African) infection, without involvement of the central nervous system. Pentamidine typically is used for first-stage T. b. gambiense (West African) infection. CDC recommends vaccinia vaccine for laboratory workers who directly handle a) cultures or b) animals contaminated or infected with nonhighly attenuated vaccinia virus, recombinant vaccinia viruses derived from nonhighly attenuated vaccinia strains, or other orthopoxviruses that infect humans (e.g., monkeypox, cowpox, vaccinia, and variola). Other health-care workers (e.g., physicians and nurses) whose contact with nonhighly attenuated vaccinia viruses is limited to contaminated materials (e.g., dressings) and who adhere to appropriate infection control measures are at lower risk for inadvertent infection than laboratory workers. However, because a theoretical risk for infection exists, vaccination can be offered to this group. Read more[PDF – 930KB](https://www.cdc.gov/mmwr/pdf/rr/rr5010.pdf). Pentavalent (ABCDE) botulinum toxoid is a combination of aluminum phosphate-adsorbed toxoid derived from formalin-inactivated types A, B, C, D, and E botulinum toxins, with formaldehyde and thimerosal used as preservatives. Botulinum toxoid was distributed by CDC under an IND protocol for at-risk persons who were actively working or expected to be working with cultures of Clostridium botulinum or the toxins; in 2011, CDC discontinued its program to supply this vaccine. Read more(https://www.cdc.gov/mmwr/preview/mmwrhtml/mm6042a3.htm). In March 2010, CDC announced the availability of a new heptavalent botulinum antitoxin (HBAT, Cangene Corporation). HBAT replaced the licensed bivalent botulinum antitoxin AB and an investigational monovalent botulinum antitoxin E (BAT-AB and BAT-E, Sanofi Pasteur), becoming the only botulinum antitoxin available in the United States for naturally occurring non-infant botulism. Read more(https://www.cdc.gov/mmwr/preview/mmwrhtml/mm5910a4.htm). Dr. Donald A. Henderson, a leader of one of mankind’s greatest public health triumphs, the eradication of smallpox, died on Friday in Towson, Md. This May, 1969 photograph was taken in the Ikoya Hotel in Lagos, Nigeria during a regional conference that same year focusing on the eradication of smallpox during worldwide eradication efforts. Former Epidemic Intelligence Officer (EIS), and in 1966 head of the World Health Organization’s (WHO) Global Smallpox Eradication Campaign, D.A. Henderson, M.D. (foreground) was shown here as he discussed the geographically plotted effects that eradication efforts were having across the world. 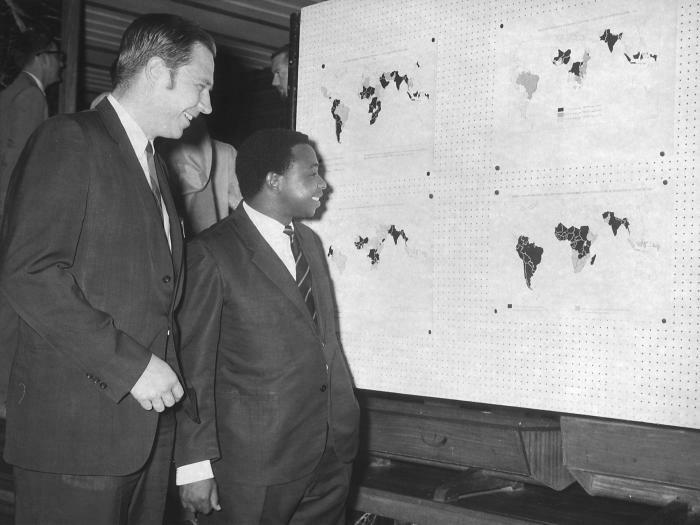 To Dr. Henderson’s left was the 1969, Nigerian Minister of Health.